Remember what happened with computer chips in the 80s? It seemed then like they got faster and cheaper every week. Breakthroughs were reported with dizzying regularity. Something similar is happening with solar cells and panels. Just last week, MIT and Masdar Institute announced they had created a new solar cell that was 35% efficient and less expensive than other high-efficiency cells. A few days ago, a team at the Swiss Federal Institute of Technology in Lausanne (EPFL) claimed it has beaten the MIT/Masdar achievement by creating a solar cell that is 36.4% efficient. That number is approximately double that of the typical solar cell used in residential solar panels today, and more efficient than anything except triple-junction and four-junction solar cells. In design, the individual calls resemble the ultra-expensive cells used in space applications. The new solar cell is currently being tested in a lab environment. As we know, getting new technology out of the lab and into commercial production is a process fraught with pitfalls and setbacks, so we’ll have to see where this one lands. A prototype has been tested by the Fraunhofer Institute, an independent lab based in Germany. That’s where the 36.4% energy conversion rate was verified. 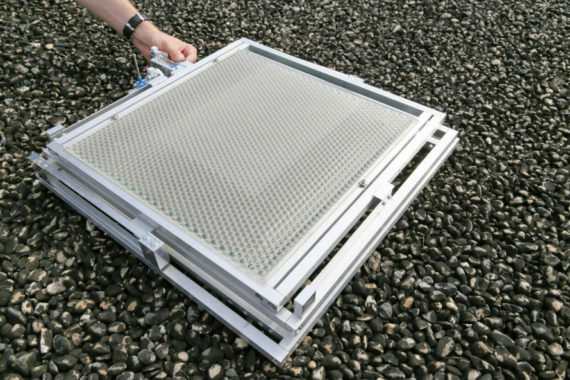 A new company called Insolight is planning to use the new cells to make high efficiency solar panels that can compete with existing residential solar arrays. The key to the Insolight cell is a thin, transparent plastic concentrator that goes over the cell and acts like a lens to focus solar energy onto the relatively tiny but super-high-performance solar cells. “It’s like a shower,” says Insolight CEO Laurent Coulot. “All the water goes down one small drain. There’s no need for the drain to cover the entire floor of the shower.” Because of the concentrator, the Insolight panels can use fewer cells per panel, which helps keep costs down. The concentrator also allows the cells to track the sun during the day, optimizing the capture of solar energy. Insolight, co-founded by Laurent Coulot and Florian Gerlich, chose to base its work on existing technology. Insolight panels use standard mounting systems, which lowers system costs when compared to the proprietary rack systems required by some advance solar panel designs. They offer the best of both worlds — the high efficiency of expensive solar cells and the cost of conventional units. This is an exciting time in the history of solar power. Today’s panels are already 10 times cheaper and more efficient than they were a decade ago. With every breakthrough, the economics in favor of renewable energy get more compelling and the case for fossil fuels becomes harder and harder to make.